At The Vault we are well known for our fanatical customer service and always going that extra mile to look after our customers and provide the best possible service and products. Well we have now gone one step further and have been busy working away on our already super competitive prices and have managed to negotiate a price reduction on over 90% of our cannabis seeds. Yep, that’s right. The BEST just got even BETTER!! 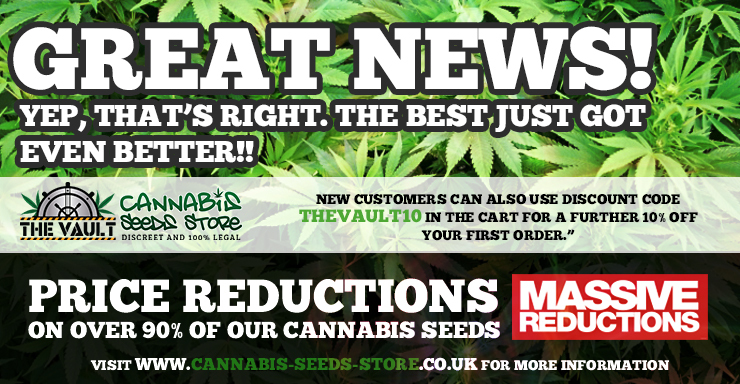 So head on over to The Vault www.cannabis-seeds-store.co.uk to check out your favourite strains and new pricing structure. Remember: With GURANTEED delivery and super STEALTH included at NO additional cost you’re always in safe hands with The Vault buddy! New customers can also use discount code TheVault10 in the cart for a further 10% off your first order. Competitions / Giveaways, Other Seeds Information, Seeds Information, Special Offers Cheap Cannabis Seeds. permalink. I want to win the seed giveaway! and if joni don’t win it.. hope its me..
Jack think i am go N to need a little help again on my next souverinear order. With the indica strains. Oh! feminize. N the haze strains. Some of the Callie purple an green haze. Said i could get 15%off with mynext order. I need a win some free stuff too. First I win, then I grow, post a journal if successful, then I brag about where I got the seeds and show off my results.